Roy is an ex-college professor, independent school headmaster, past President of the Arizona Association of Independent Schools, and former-Marine captain who, after twenty-five years in education, found himself drawn to a career in Sedona real estate. Always passionate about providing his clients with beneficial services well beyond those of conventional real estate agents, Roy soon committed himself exclusively to Buyer’s Agency. Along the way he honed his skills by earning a number of challenging designations, among them: Certified Residential Specialist (the top 5% of residential agents in the US); Certified International Property Specialist (one of 30 in the State of Arizona); Resort & Second Home Specialist (one of the founders of this National Assoc. of REALTOR® group); and Master Certified Exclusive Buyer’s Agent. Roy is a past member and Regional Director of the National Association of Exclusive Buyer’s Agents – he helped design and taught the curriculum for its Certified Exclusive Buyer’s Agent course. Few agents in the nation can offer their clients Roy’s level of professional expertise. 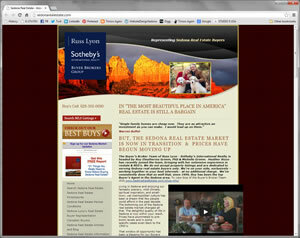 Merging his company, Buyer Brokers of Sedona, with Russ Lyon Sotheby’s International Realty in January, 2009, Roy and his team formed the Buyer Brokers Group – essentially still operating as buyer’s agents exclusively under the umbrella of RLSIR. Happily, freed of the administrative burden of running his own company, Roy returned to his real love: serving his clients directly as their representative and advocate. Over the years from 1999 to the present, he has been the number one agent representing the buyer’s side in the Sedona and the Verde Valley, as measured by volume of transactions. That’s simply an indication that buyers are strongly drawn to his professionalism and are well benefited by his services on their behalf. One of the early leaders in Sedona luxury real estate, Roy was one of the founding members and is a past President of the Sedona Luxury Real Estate Professionals, a group dedicated to raising practitioner standards in that market sector. He holds the Certified Luxury Home Specialist designation and is recognized by the highly-selective and prestigious Who’s Who in Luxury Real Estate. A native Arizonan who, in his characteristic contrarian fashion, grew up in New York, Roy moved to Sedona from Boulder, Colorado in 1991 and was the headmaster of Verde Valley School for five years before retiring from education and entering the real estate field. He truly loves the aesthetic, cultural, and spiritual qualities of Sedona as well as its wild natural beauty. He and his faithful Great Pyrenees, Athena and White Lab, Dudley, were often found hiking the extensive trails of the area and swimming in Oak Creek over the years. He’ll be happy to tell you about his favorite spots. Athena and Dudley have since passed on and the next generation of Roy and Michelle’s trail companions has arrived, a delightful pair of pups, Zoe & Zeus.